It may no longer be good enough to hang your food in a tree to keep it away from bears when you go camping, a new study suggests. 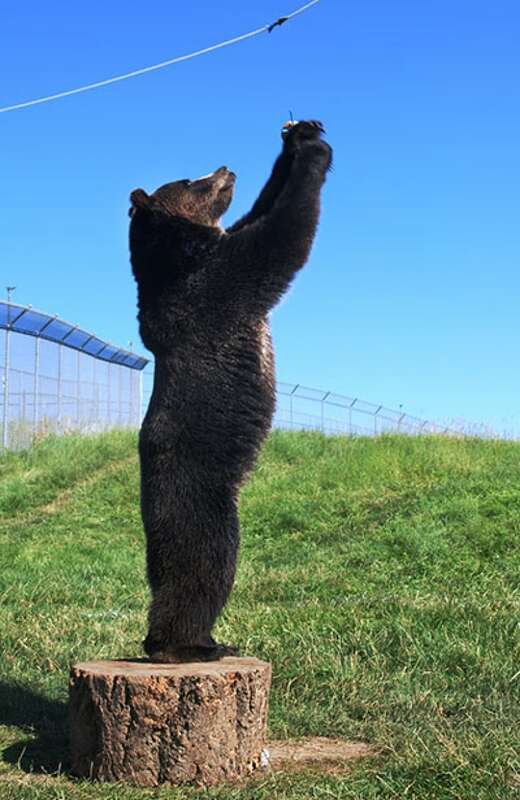 Three-year-old grizzly bear Roan has just figured out that he can move the stump in order to stand upon it and grab a doughnut hanging out of reach during a study by Washington State University researchers. (Washington State University)It may no longer be good enough to hang your food in a tree to keep it away from bears when you go camping, according to a first-of-its-kind study at the Washington State University Bear Research Education and Conservation Center. Some — but not all — grizzlies can use primitive tools to thwart your efforts, veterinary student Alex Waroff found this summer in an experiment assisted by Charlie Robbins, WSU bear centre director, and O. Lynne Nelson, assistant director and professor of cardiology at WSU's Veterinary Teaching Hospital. Nelson said the idea for the study came from a report in a peer-reviewed journal of "first tool use" by a brown bear in Alaska. "The bear was observed to pick up a rock or shell and use it to scratch his face," Nelson said. "Those of us who work with bears read the report and essentially said, 'Really? Is that the best you have?' "Nelson said the idea for the study came from a report in a peer-reviewed journal of "first tool use" by a brown bear in Alaska. Nelson said she, and others who work with bears, see evidence of bears manipulating objects for a specific goal all the time — the definition of tool use. "Of course, all of these observations are anecdote," she said. "So we decided to put this problem-solving skill to standardized research protocol." 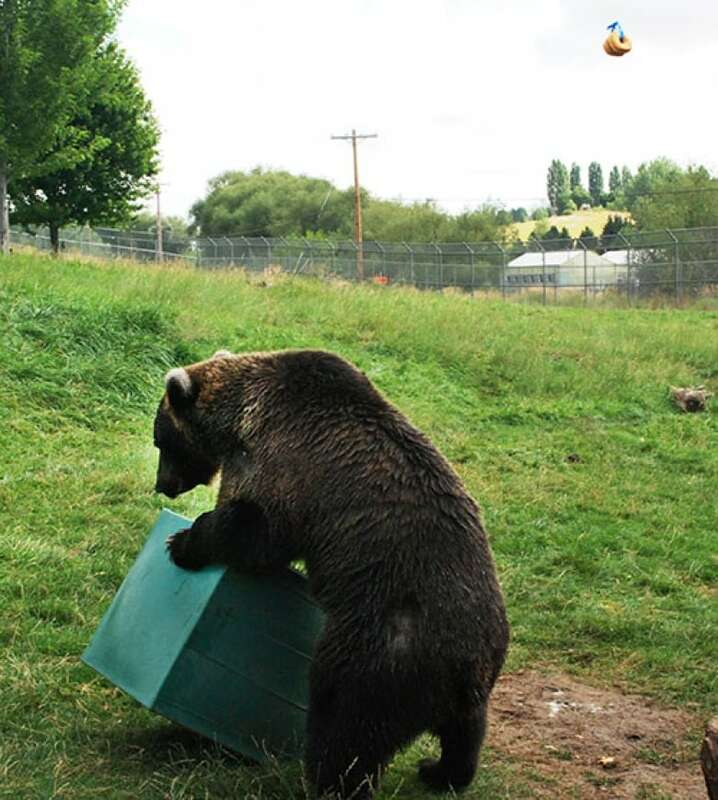 The study's participants are eight grizzly bears — five males and three females — who are challenged to get their paws on a glazed doughnut hung out of reach in their play area on the WSU campus. Researchers place a sawed-off tree stump below the hanging treat to see if the animals will stand on it to reach the object of their desire. Once they do, the stump is turned on its side and moved away from the treat. Researchers observe whether the bears will move it back under the doughnut. So far, researchers have identified one bear — a nine-year-old female — who has become the star of the show. Kio, who was born in the centre in 2005, has sailed through the tasks, while others are still discovering the basics. "She manipulates an inanimate object in several steps to help her achieve a goal, which in this case is to obtain food. This fits the definition of tool use," Nelson said. She said the value in this study will be to assist professionals like wildlife managers to address bear-related problems and zookeepers to keep their captive wards mentally and physically stimulated. "This study helps us understand something about the evolution of problem solving in bears and how it compares to other species, including humans. It helps us to understand the way bears think and perhaps how we might anticipate and alter our practices in backcountry places and campgrounds," Nelson said. She said it also shows how a species may adapt to a changing environment. "Being able to problem solve allows for a species to 'think outside the box' so to speak. This may be important if habitat and food resources change." Nelson said she and the other researchers have plans to continue with other bear-related studies after this one is completed in the fall. "People often don't like to see us feeding the bears sweets such as doughnuts," she said. "I really appreciate that and I am glad that people care. We do give sweets as special treats, but not as a major part of their diet."